Slowly getting back into the rhythm of things since coming back from vacation. Yesterday I managed to sit down between batches of laundry to do some work on the Ann Grimshaw sampler, and today, again, between household chores, sat down to work on a quilt from my friend Mieke's stash. I was planning on showing some goodies brought back from Italy, but haven't had the time to sit and photograph those yet - call it laziness! As I've mentioned before, my friend Mieke is no longer able to quilt for health reasons and so has given me her stash to do with as I please. In return (shhh! don't tell her!) I've been going through her stash, pulling out unfinished projects to complete and give to her so she may enjoy them. It's my way of thanking her. So here's a shot of a baby quilt I found in one of the boxes: it was cut and pinned, but not very well, so I took it apart, replaced the original thick polyester batting that my machine would refuse to make good stitches for, and replaced it with a cotton batting that my Pfaff is much happier with. I'm machine quilting it in a simple cross-hatch pattern. Once that's done, I'll dig around my own stash and try to find a matching fabric for the binding. It was intended for her granddaughter and started before she was born, but can still be used for nap time, or snuggle under during reading time. It took a bit getting used to quilting by machine, the fiddling with the fabric, keeping it neat so the stitching would be straight. Even though I was careful to make light pencil lines using my quilt pencil, the lines came out quite dark, so I hope they will come out in the wash! This is good practice in either case: my red and white log cabin quilt is still rolled up, waiting to be quilted, so hopefully I'll be more confident when I get to that project, which will be very soon! There's another project for Mieke coming up soon, this time from a kit we both bought a year or so ago. My top is already completed, and waiting on the WIP pile, while hers needs to be cut and sewn. 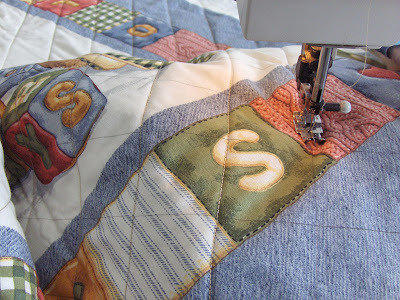 This time I'll be employing the help of another quilting friend to sew it together so we can get it done on time to give both quilts to Mieke for her birthday this month. Will we get it all done in time? Stayed tuned to find out! How nice of you! I did that with cross stitch projects my mother in law left behind and gifted them to family. Bless you heart for finishing Mieke's WIP's. She is going to be so happy to see them done! Mieke loved her last gift: I went to see her yesterday in her new home and she showed it to me, in full use! I checked out the panel and indeed, it's the same one! Today I'll be working the cross hatches going the other direction. I still think hand quilting is easier though - all that fuss with turning the fabric and getting it right under the needle...pfffft! More practice is needed I guess...lol!